Great attention-grabbing graphics and creative levels design. Pankapu gives off a storybook feel, which makes the player want more after they have completed it. The lack of instructions or hints during new obstacles and challenges was a bit frustrating. I found myself facing off against bosses longer than necessary due to the lack of direction as to how to defeat them. Pankapu is a blast from the past. 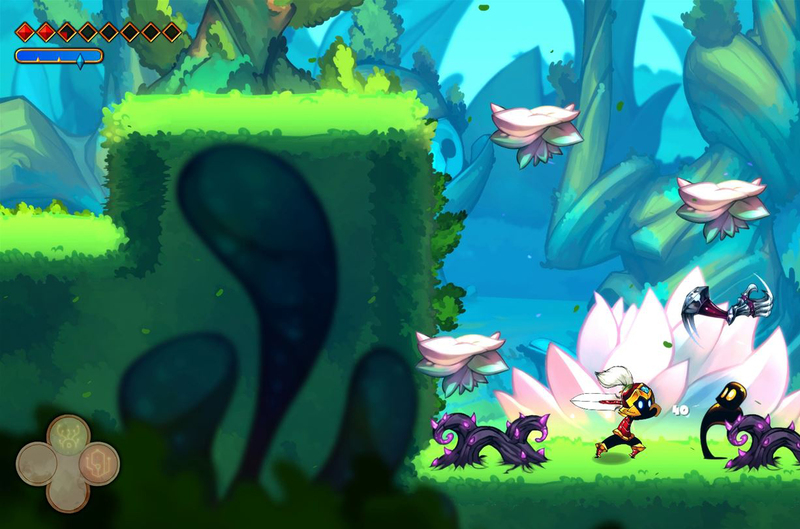 The game brings the player back to their childhood memories of platformers and offers adventure for players of any age. To be honest I wasn't ready for the game to be over. Pankapu's storyline and ending had me wanting more. I would pay $11.99 to play this game because the level of design and details of the game really adds to the value. If there is a second game to this story I will be buying it in the future. The story is the first thing that got me fully into the game. The storybook theme brought the narration to life as the father read the story of Pankapu to the child. Throughout the game you get flashbacks of the child which was a nice addition, but was only limited to pictures and sounds. I didn't get the full story of what was happening. I used the connection of the characters in Omina and the child's flashbacks to get an understanding of what they meant. Each character added to the story with relatable personalities and some comic relief. Chii is one of the first characters you meet through the first level and he becomes Pankapu's friend and sidekick throughout the rest of his adventures. Chii provided some hints during gameplay and jokes towards the enemies, which was a nice little touch to keep the player's attention. What really surprised me was how detailed and interesting the storyline became in Pankapu. At first, I thought I fully understood the game and story, which in my opinion was a downside because I felt the story was straightforward. Pankapu was the hero that will save Omina, but there is a twist that changed the story altogether and even the end leaves the player with a cliff hanger. Honestly, I have never played a platformer that made me want more. I have to say that the story is what makes Pankapu whole. At first, I felt that Pankapu was directed more towards a younger crowd, but as you progress through the story and levels, the difficulty increases. As a platform game, it provides great level layouts and obstacles. Combat was a big weakness. Most combat throughout the game could be avoided. However, when you decided to attack an enemy, point values would appear after each hit. It was unclear what these values mean since you didn't gain experience points or rewards for defeating an enemy. Without fighting the Hya'Nagi, which are the creatures that came from the Nightmare world, the gameplay became boring and uninteresting. On a positive note, each boss battle was unique and made the game more memorable. Each level had side objectives which added a little more of a challenge in the game. For example, Pankapu needs to find the Mudjins, which were inviable folks in Omina. This was easy enough and added replay value to the game. Overall the gameplay was not challenging enough with easy enemies and lack of obstacles. Pankapu's controls are pretty basic. You have jump, block, attack, and special which also counts for your air attack. In the beginning of the game the controls seem straight forward and didn't need much thought when completing the levels. As you progress through the story and start to level up, the controls can become a bit tricky. Your character is given aegises, which are your character's different abilities. When I was given a second aegise, the switch between them was simple with two-button controls. Though once the player is faced with a difficult level, switching between the aegises to get past certain obstacles can be challenging. I found myself losing track of which aegises I needed and sometimes hit the wrong control to get the correct one. Never the less I didn't think that this brought the game down in anyway. One down side was the pause menu, which was a tad sluggish because it literally turns each page of the book. I value the creativity, but this made accessing character information and other options more time consuming. This made me feel like I missed out on character information while playing. I found myself reading and navigating through options when I needed a break from gameplay. Now I do value the simplicity of the controls along with how fast and easy it is to change your abilities. Pankapu does a great job with the designs and layout of the game. Omina in specific is eye-catching with vivid colors and a foreground that adds dimensions. Each level has the same hand drawn artistry, which illustrates the amount of thought and time the developers have put into the game's aesthetic. Pankapu's 2D design fits right in the world of platformers. The character Pankapu has the option to be customized to either dream or nightmare style characters. The only down side to this customization was the fact it was only enforced during gameplay. Whenever the characters interacted with one another Pankapu would be displayed as the original design. However; developers made sure to continue with the hand drawn artistry down to the smallest detail like the pause menu. The pause menu is designed as a book with hand drawn illustrations of each character. Overall the aesthetic of Pankapu was well thought out and creative. The sound design of the game fits perfectly. The music sets the tone of the dream world, Omina and provides a soft, dream-like feel to the game. As great as the music is, it did feel a little overpowering when compared to other sounds in the game. I chose to lower the music to level 2 to appreciate the sound effects that had been created for the levels and characters. Upon altering the music volume, the gameplay along with the sound and music was excellent. The sound details in each level were very creative. For example, in the level "White Path" as the player jumped across platforms, each platform would resonate a unique instrument sound. To fully submerge myself into the story, I found that headphones greatly elevated the music, sound effects, and narration.